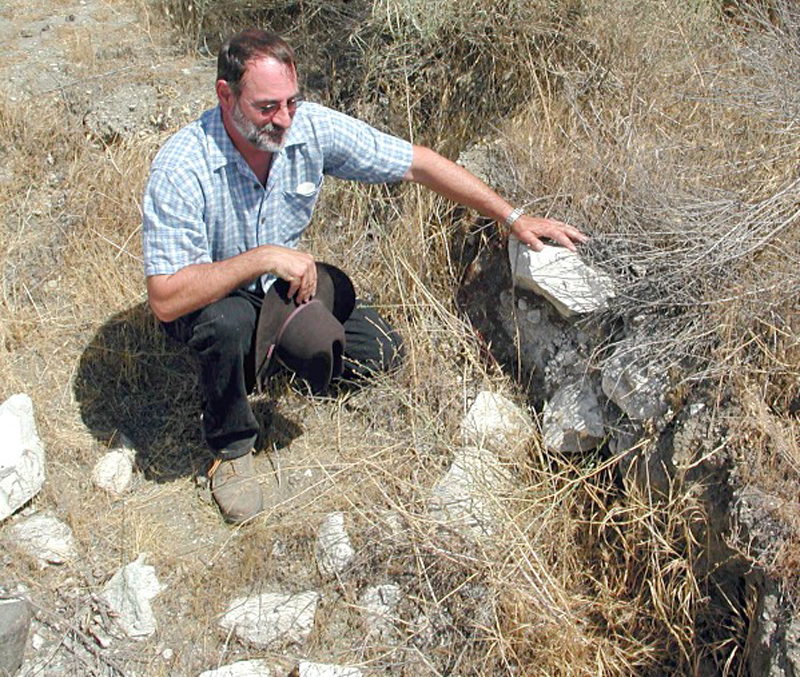 September 5, 2001: Alan Bofenkamp, first vice president of the Santa Clarita Valley Historical Society, points out the possible foundation of the Lang Hotel, an inn and health spa with sulfurous springs (thus the local name, Sulphur Springs) built by homesteader and entrepreneur John Lang in 1871. The area became known as "Lang," and a train station bearing the name was erected adjacent to the hotel in 1876 when the Southern Pacific Railroad came through the area. Lang's hotel burned down in the first decade of the 20th Century and a warehouse was built atop it; the warehouse also did not last. The photograph was shot on the same side of the Santa Clara River as the SPRR Lang Depot (the south side), just a couple of hundred yards to the west of it. Bofenkamp said a corner of the hotel was located where he is kneeling. John Lang was ... a pioneer by instinct. Coming to California in 1854, he had made the first cheese vats in the State. He was in the Nevada Comstock Rush, but his wife's health forced a move to Los Angeles where he developed 35 acres in fruits and vegetables profitably. LW2144: Digital image by Leon Worden.